Transportation Costs > How Much Does Reupholstering a Car Cost? How Much Does Reupholstering a Car Cost? Depending on what is chosen, the seats, carpets, side panels and headliners can all be replaced. Reupholstering a car is a restoration procedure performed to a car’s interior that involves changing or upgrading car upholstery such as the carpet, car seats and door panels. Reupholstering a car may involve upgrading the whole interior or specific areas that may be torn or simply worn out. The price for this procedure depends on the type of car, the make and model., the type of upholstery needed and the professional performing the job. How much does reupholstering a car seat cost? On average, reupholstering a car seat can cost anywhere from $150 to as much as $650 per seat, depending on the type of material being used and the extent of the repair. Replacing just the bottom of the seat, for example, could cost $250 to $350, while reholstering the entire seat could cost $450 to $650. Most of your luxury cars will be more since it uses a higher quality fabric when compared to a standard vinyl material found in your average four-door sedan. Replacing the headliner can cost anywhere from $175 to $450, depending on the size of the car. A four-door sedan, for instance, will be about 40 percent cheaper than a minivan. Reupholstering a car completely can range anywhere from the low $300s to as much as $2,500. According to the experts we had talked to, the most common repair these professionals receive are commonly for ripped or damaged seats, especially in the seat bolster area, which is the curved area that’s around the edge of the seat. Replacing a bolster, for instance, can cost anywhere from $175 to $300 per bolster, but this can go down if you were to have all the bolsters replaced at once. Replacing the carpet with either an aftermarket or factory carpet can cost anywhere from $700 to $1,200. Angie’s List says you should be prepared to pay about $800 for a reholstering kit and another $700, bringing the average cost to about $2,500. 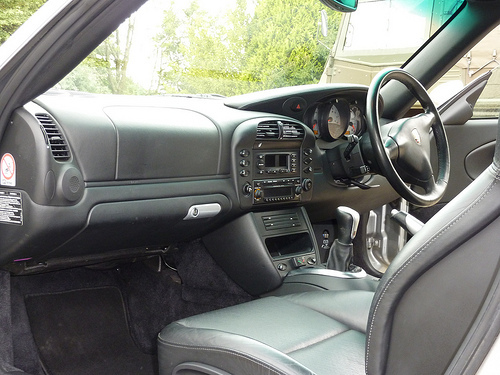 On thirdgen.org, one members aid he paid $900 for the headliner, door panels and the seats, while another member had paid $220 for a seat that matched the factory colors. Popular Mechanics listed a few pictures, along with cheap ways to fix your car’s interior. According to the article, replacing the floor console could cost $300 to $500 if you were to use a professional or $50 to $200 if you were to need a professional to replace a torn seat. Professionals are able to use a variety of materials, include vinyl, leather, plastic and fabric. Most companies will work directly with the factory, and if the car is not that old, the exact fabric can be matched to what is already inside the car. If the carpet matches the factory version, then the expert may be able to fix the problem area alone rather than replace the entire interior of the car. A professional auto upholster can oftentimes even fix rips, stains or tears without having to replace the fabric by using a dye. Depending on what is chosen, the seats, carpets, side panels and headliners can all be replaced. For instance, if you were to have your car seat upholstered, the professional will remove them from the vehicle, remove the car seat fabric and replace/repair it will the new choice. He or she will also check the springs and foam and make the repairs as needed. These jobs can be commonly done at an automotive upholstery shop, furniture upholstery retailers or at some car audio centers. Customized car carpet that can’t be ordered from the factory or the distributor the company uses may lead to an additional charge. To keep your leather from “cold cracking” or wrinkling, make it a habit of applying a lubricant every season. Sometimes, a professional may not need to reholster the area; instead, they can simply use a dye to blend in the scratches or scuffs. Be specific when having your interior changed, and only reupholster the part that needs it badly to avoid additional costs. Even if the material does not match exactly, as long as you can get it close, it will be worth the money you save. Consider purchasing car seat covers for a fraction of the cost, usually less than $75 per seat. These covers can protect the seats from wear and tear and will be much less than using a professional. Car seat repair kits are often found online for less than $20, and these kits are designed to fix stains, rips or tears in a matter of minutes.